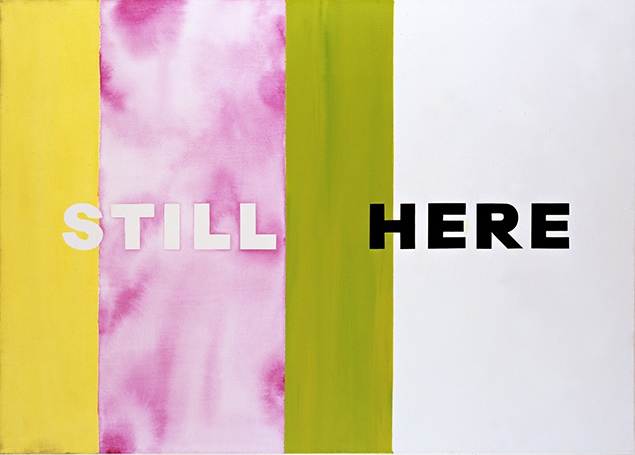 Deborah Kass, Still Here, 2007. Oil and acrylic on canvas, 45 × 63 inches. From Art AIDS America. Private collection. My recollection of We are safe and all is well in our world, a group exhibition curated by Rui Mateus Amaral for Scrap Metal Gallery, begins with a piece of wall text presented at the entrance of the gallery. It asks visitors to consider wiping off their wet shoes on a slim vertical strip of brown wrapping paper located nearby. Arriving at the gallery on a particularly snowy afternoon, my guest and I unsuccessfully attempted to dry our shoes by rubbing and dragging our feet across the strip until its delicate surface began to pill and partially rip. Installation view of We Are Safe and All Is Well In Our World, with Robert Mapplethorpe's "Calla Lily" at Scrap Metal Gallery. Image courtesy Scrap Metal Gallery, Toronto. 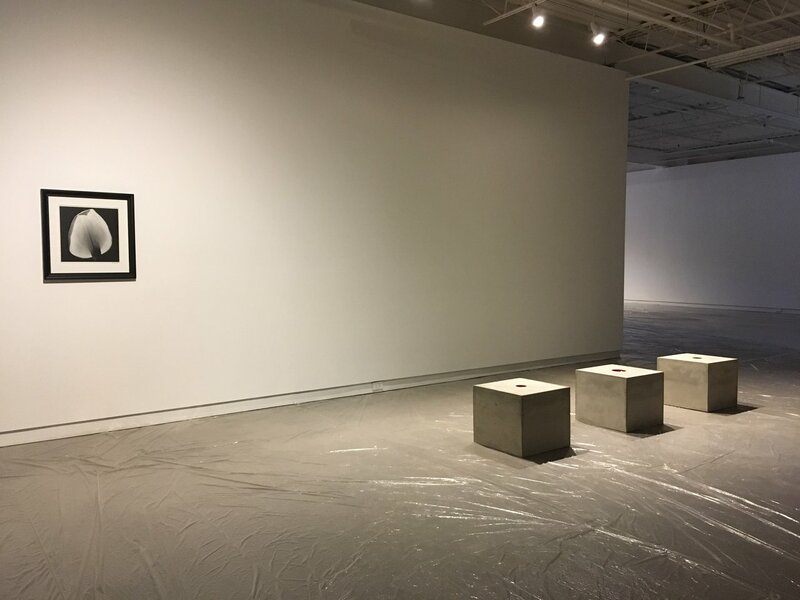 Subsequently, we entered into the exhibition space by stepping from the damp and damaged paper onto the rippled plastic sheets that completely cover the concrete floor of the gallery. From afar, the events leading up to my entrance into this space may appear insignificant to the reader. However, the somewhat bizarre floor exercise and play of materials gave rise to a sense of self-awareness that shaped my interaction with the exhibition in its entirety. No matter how unintentional the original use the paper strip was, this heightened attention to the body moving through space helps situate my interest in the exhibition as a site from which to investigate affect from a queer curatorial perspective. It is first necessary to provide a brief walk-through of We are safe. At a reading station located close to the paper mat, we encounter a presentation of closed books, some of which include Charles Baudelaire’s Les Fleurs du mal, Susan Sontag’s Illness as Metaphor and AIDS and its Metaphors, David France’s How to Survive a Plague, and Douglas Crimp’s Before Pictures. This modest library stands as a kind of prelude, introducing the spectator to the general thematic focus of the exhibition through means other than the didactic vinyl wall text traditionally used in gallery settings. Turning the corner around the partition, we step onto the unusual plastic covering, the floor’s second skin, and enter into a large space containing five works by four renowned queer male artists. This particular selection of works advances ideas of pleasure, erotics and perversity through repeated references to flowers and prefabricated minimalist forms. First, located on opposite sides of the gallery, we encounter Paul P.’s Untitled (2004), a small oil painting depicting a partially cropped, stem-less bouquet of flowers, and Robert Gober’s Drawing for the Slanted Sink (1985), which is both a visual study on industrial form and a partial reference to themes of sterility and infection in relation to the AIDS crisis. The exhibition also includes two works by Chris Curreri that center on the figure of the vessel as object and metaphor. Red Vase Collection (2008-ongoing) is based on the artist’s personal collection of empty red vases, offering a material and symbolic inversion of P.’s Untitled. Curreri’s other work, titled Proud Flesh (2011), consists of three hybrid concrete-vase forms that produce suggestive bodily associations. Finally, as an extension of the dynamic explored through P.’s painting, this work is presented alongside Robert Mapplethorpe’s Calla Lily (1984), a photograph of the pedals of a lily flower shot in his iconic high contrast black and white style. 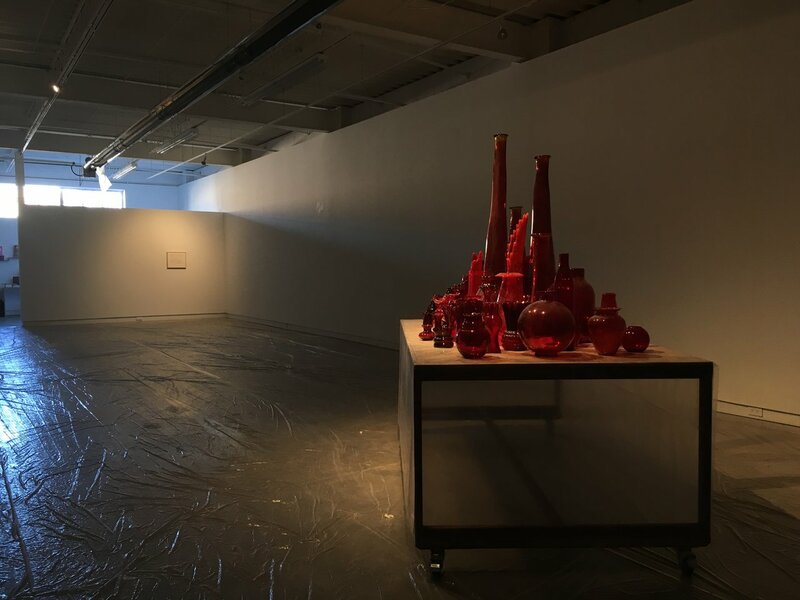 Installation view of We Are Safe and All Is Well In Our World at Scrap Metal Gallery, Toronto, with Chris Curreri's Red Vase Collection in foreground. This brief examination of the contents of the exhibition demonstrates how the curator advances scenes of non-disclosure as opposed to explicit pictorial references to identity politics. We are safe taps into a mode of political expression that extends beyond widespread demands for queer visibility in mainstream culture. Instead, it operates within the realm of queer affect, or, affective queerness. Used in the context of contemporary philosophical thought, affect encompasses that which escapes the logic of representation by embracing the slippery, imperceptible aspects of bodily experience. 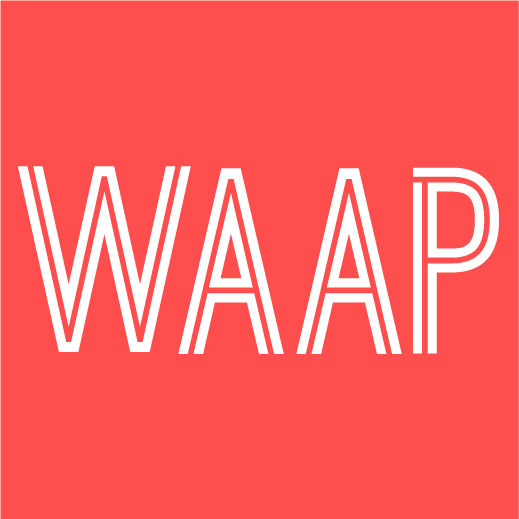 We are safe neither poses clear questions nor searches for definite answers, moving away from traditional autobiographical, documentary-based representational practices so often used to construct truths about queer identity and queer community. By contrast, the exhibition advances display tactics that implicate the body of the spectator in uncertain and indeterminate situations of queer undetectability. Notably, through the curator’s decision to fit the concrete floor with a plastic covering, along with his incorporation of vast open spaces between the works and use dramatic lighting throughout the gallery, the exhibition upholds a mode of spectatorship based on heightened awareness of bodily presence on-site. These display tactics support the curator’s examination of queerness and HIV/AIDS through abstract, affective considerations of bodily excess, and cultural memory that cannot be reduced to the restrictive language of art history discourse. Given these considerations, we the spectator are positioned within a complex metaphoric space staked between the weight of collective history and the uncertainty of our personal and political futures. Within this discussion on curatorial practice and affect, how might We are safe be distinguished from other contemporary group exhibitions that address body politics, queerness and HIV/AIDS? To develop this point, it is useful to consider the ways in which the exhibition distances itself from other projects that are primarily concerned with uncovering hidden queer figures in the art history. In particular, we can turn to the group exhibition Art AIDS America, originally presented in 2015 at the Tacoma Art Museum. Curated by Jonathan Katz and Rock Hushka, Art AIDS America presents a diverse group of 120 mostly queer artistic responses to AIDS in chronological order, spanning from the beginning of the crisis to the contemporary moment. The curators frame the exhibition as “the first comprehensive overview exclusively focused on 30 years of art made in response to the AIDS epidemic in the United States.”1 This bold declaration begs the question: What is at stake in this decision to group together artists as radically diverse as David Wojnarowicz, Scott Burton, and Kia Labeija under the same curatorial rubric and within the same didactic museum space? Albert J. Winn: Akedah, 1995. Gelatin silver print, from Art AIDS America. Courtesy of Scott Portnoff. Art AIDS America runs the risk of producing purifying definitions of identity supported by a pseudo-objectivist, exclusionary historical reading of this subject. It could therefore be argued that the curators attempt to combat normative heterosexist discourses by exhibiting forms of determinate art historical homonormativity. In this regard, the exhibition treads at the intersection of art history, queer history, and the history of HIV/AIDS in pursuit of another disciplinary category altogether: The queer art history of HIV/AIDS. Katz and Hushka highlight artworks produced by and of predominantly queer subjects affected by HIV/AIDS in the hopes of amending the exclusionary Western art history canon and promoting a more inclusive mode of curatorial practice. Put differently, they use the exhibition as a platform to argue that these particular forms of cultural evidence belong within the space of the art museum and within the mainstream discourse of Western art history. Ultimately, then, Art AIDS America positions these works within a restrictive visibility/invisibility binary, which is rooted in what we might call ‘the risk of invisibility’ – namely, the risk that certain artists, artworks, and activisms will be undocumented by major institutions and eventually forgotten. This brief comparison of Art AIDS America and We are safe reveals a gap in current research on the multiple different ways in which curators choose to define queer politics and queer aesthetics. Corresponding with the examples outlined above, we can identify two related yet altogether distinct modes of curatorial engagement that help describe a key contrast: first, a curating “queer” approach, and second, a queer curating approach. On the one hand, the curating “queer” approach either explicitly or implicitly constructs a causal relationship between identity and artistic production. On the other hand, the queer curating approach does not simply treat identity itself as a determinate thing or targeted object of analysis, but encompasses a way of thinking, a way of reading, and a way of doing. The former employs “queer” in the nominal sense, while the latter use of the term functions as an adjectival descriptor of a qualitative methodology. Thus, queer curating is not solely concerned with the visibility of certain identifiable groups of artists within the mainstream discourse of Western art history. Indeed, the “queer” in queer curating identifies a promiscuous transgression of the boundaries of what is known and knowable about queerness in and through the practice of curating. We are safe exemplifies this reading of queer curating through its interest in embodied spectatorship, relationality, and queer affect. In its rejection of the historical determinism that lies at the core of Katz and Huska’s approach, the exhibition highlights the impossibility of a single, shared queer art history of HIV/AIDS. Cultivating this knowledge in a curatorial context means embracing the work that artworks cannot do as representational objects, and furthermore, underlining the fact that queerness itself is a necessarily impossible object of representation. As evidenced by We are safe, this reading of queer curating does not encompass a restrictive process that yields specific outcomes. Still, it is clear that there exists a range of ambiguous grey territory between the two approaches outlined above. What matters most is that the comparison yields a theory of queer curating through which to imagine queer curatorial practices that resist assimilation into either rigid cultural essentialisms or the problematic rhetoric of “post-everything” identity politics. Adam Barbu is a writer and curator living between Toronto and Ottawa, Canada. His current work focuses on queer theory and the politics of spectatorship. In 2015, he was the recipient of the Middlebook Prize for Young Canadian Curators.